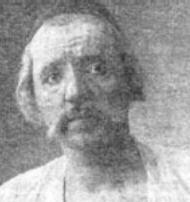 The bass, Ivan Voulpe, was born 1 September 1876 in Bolgrad, Bessarabia to a Bulgarian family. His mother played the piano and was his first teacher. Following graduation from the Bulgarian Secondary School in Bolgrad he continued his education in voice at the Moscow Conservatory. In 1899 he made an impression on Konstantin Michailov-Stojan during his first stage performances. He graduated in 1902 from the Moscow Conservatory with the degree Free Artist of the Moscow Conservatory. In 1901 he was a chorus member and performer of small roles at the Vinter Private Opera and Zimin Opera. In 1902 he performed in concert tours throughout Russia and Ukraine. In 1907 after receiving an offer of a concert tour in Bulgaria by Michailov-Stojan he received much attention. These concerts caused many newspaper discussions for creating the Bulgarian Opera Theater. Between 1907-8 he performed with the Zimin Moscow Theater. In 1908 Voulpe and his wife, the opera singer Bodgana Ghiuseleva, came to Bulgaria and joined the artistic group, which was created for realizing opera performances. This group later became a base for establishing the Bulgarska Operna Drushba (Bulgarian Opera Society). Voulpe and Ghiuseleva were initiators and founders of the first music institutions in Bulgaria, the Bulgarska Operna Drushba and the Private Music School. At the Sofia Opera Voulpe worked as a soloist in many operas until May 5, 1926 when he was fired because of his Russian connections. In addition to bringing to Bulgaria the Russian Opera tradition, the real fame of Voulpe was in his teaching. In 1903 he taught at the Music School of the Russian Imperial Music Society. After moving to Bulgaria he became much sought after as a vocal pedagogue. In 1912 he gave vocal lessons at the State Music School, which was established by him, and later in 1921 at the State Academy of Music. Among his students were the best of the Bulgarian singers: Petar Raichev, Ana Todorova, Michail Popov, Christo Brambarov, Ilka Popova, Konstanza Kirova and Elena Nicolai. His efforts led to acceptance of the idea of creating Bulgarian Opera and initiated a national tradition of classical singing. He is the first and main performer of the bass roles in the first Bulgarian opera works. Ivan Voulpe died 26 August 1929.